The American Treasure Tour is always proud to honor our nation's first responders. They unquestionably hold some of the most crucial jobs in keeping us safe as a nation. That being the case, you may wonder why we talk about them in the same breath as "Wacky Wednesday." We're not really sure, honestly, but we do think our first responder pictured here is kinda silly. To be honest, I wouldn't really count on him to be anything but cute. He is sitting in the driver's seat of an actual electric transportation device used by first responders, though. 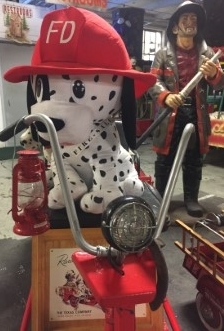 We hope you enjoy our Dalmatian puppy Fido, and never forget to thank your local first responders for what they do.